The Puget Sound chapter of the Human Factors and Ergonomics Society held its annual Occupational Ergonomics Symposium and Workshop on September 18th and 19th at the Seattle Museum of Flight. The Symposium has a great response from attendees every year, and this year’s event was no different. The two-day event drew more than 120 of the area’s ergonomists, engineers, vocational rehabilitation counselors, safety and health managers, occupational health nurses and physical/occupational therapists. Our event this year was supported by a dozen outstanding sponsors and exhibitors, whom without, we could not have such a truly successful event year after year. Thank you, again, so much! 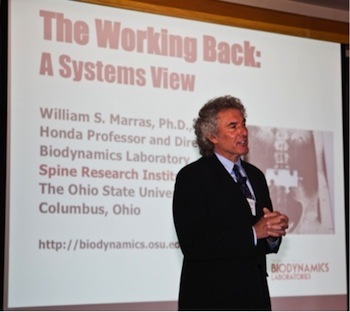 This year’s keynote speaker, Dr. William Marras, serves as the director of the Biodynamics Laboratory and the Center for Occupational Health in Automobile Manufacturing, and he is executive director of the Institute for Ergonomics. Dr. Marras delivered a memorable presentation on the working back and the causal factors associated with low back pain. Dr. Marras presenting on The Working Back. Dr. Marras began by presenting some rather sobering statistics around the cost and effectiveness of treatment for low back pain. Dr. Marras added that over the past decade much of the contemporary scientific findings have been able to identify how many diverse risk factors (physical work requirements, individual factors, psychosocial environments) can all influence low back disorder risk. Dr. Marras demonstrated how these factors can influence a common causal pathway and discussed the types of prevention strategies that are most likely to control low back problems in the workplace. Dr. Marras’ presentation is available online via the Spine Research Institute Events page. Dr. Stephen Bao, SHARP, presented on a current epidemiology surveillance study on finding causes of musculoskeletal disorders and identifying best practices among industries with a high workers’ compensation rates due to work-related MSDs. There was a lot of interest in Dr. Bao’s study and we look forward to bringing him back to present the results. Dr. Dan Anton of the Eastern Washington University Ergonomics Lab, demonstrated the values and challenges of interactive eLearning for ergonomic training programs and demonstrated some of the materials developed through Eastern Washington University. Betsy Hart, Jefferson Health Care, discussed her journey in ergonomics program development which resulted in an engaging discussion on successes and barriers when developing a program and acquiring support. Dr. Peregrin Speilholz, The Boeing Company, presented on some of the benefits and challenges in prevention through design and the incorporation of ergonomics and safety requirements in the design/build processes. Deborah Read, ErgoFit Consulting, and Steve Russell, The Boeing Company, shared personal stories from early in their careers to help demonstrate that failure is an option and that some of the most valuable learning experiences come from project failures and speed bumps. Nan Womack, Ergonomics Lead/Living Well Co-Coordinator, Kim Pearson, Nurse/Living Well Co-Coordinator, Kapstone and Gene Berry, Active Release Technician, presented their success story with Forklift drivers injury reduction at Longview Fibre by utilizing a holistic approach to employee wellness. The second day was devoted to our workshop focused on manual material handling (MMH). We had a great group of presenters on hand to deliver a well rounded approach to understanding the concepts around lifting/carrying and pushing/pulling. Participants were presented with a thorough background of the biomechanics centered around MMH as well as the scientific basis for tools commonly referenced in risk assessments. Through this in-depth background and hands-on approach attendees were taught the principles used to develop MMH standards and how to apply them in an appropriate and practical manner. A special thanks to our group of presenters: Deb Read, Ergofit Consulting, Dr. Stephen Bao, SHARP, James Gallante, EASE Council Chairperson, Ernesto Carcamo and Rick Goggins, Washington Department of L&I, Cindy Williamson and Gary Davis, The Boeing Company.